Author-χ is a Java-based system for access control to XML documents. 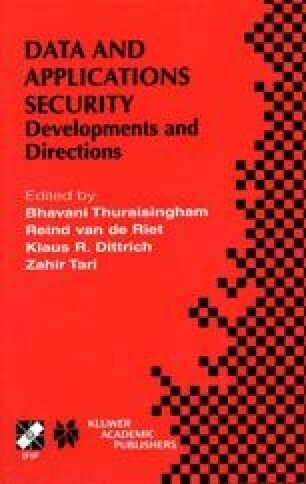 Author-χ implements a discretionary access control model specifically tailored to the characteristics of XML documents. In particular, our system allows (i) a set-oriented and single-oriented document protection, by supporting authorizations both at document type and document level; (ii) a differentiated protection of document/document type contents by supporting multi-granularity protection objects and positive/negative authorizations; (iii) a controlled propagation of authorizations among protection objects, by enforcing multiple propagation options. This work has been partially supported by a grant from Microsoft Research. Sigmod Record XML Database, http://www.dia.uniroma3. it/Areneus/Sigmod/. W3C. Document Object Model 1, 1998. http://www.w3.org/DOM/. W3C. Extensible Markup Language 1.0, 1998. http://www.w3.org/TR/REC-xml. W3C. XML Path Language, 1.0, 1999. http://www.w3.org/TR/xpath.